Today has been an overwhelming experience! 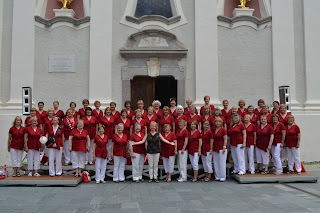 For this blog we want to share with you all of the joyous feelings we are experiencing and the incredible feedback we have been receiving from countries from all over the world......this has been been for us an experience likened only to an event like the olympics!!! 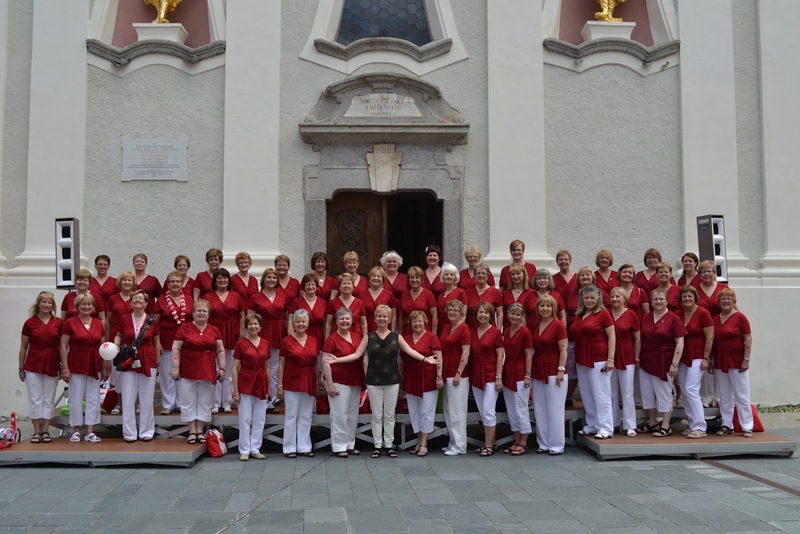 At 1:30 today we sang at an open air concert in San Candido with choirs from South Africa, Italy , USA, Brazil and Czech Republic. 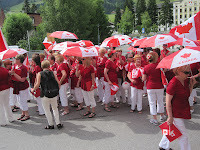 The highlight of today was the Choirs parade through the streets of San Candido - 92 Choirs in total participated......there were colors and flags and singing and many international friendships were forged. Your music has kissed my ears! You are bella bella bella!! Where can we hear you perform again? You are so very generous! As Valerie so eloquently described as she was preparing us for our day, we are amabassadors of peace through our gift of music to all! To quote from one of our songs with the greatest audience impact - "Music builds a bridge, it can tear down a wall....Music is a languiage that can speak to one and all..........THIS IS WHY WE SING........."
Finishing our day at the Piazza del Magistrato with 3200 other singers in a spirit of unity, was a life altering experience; to share the space, the songs and the love that flowed freely was a gift for each of us!!! We are truly blessed. Wow..I am having "cold shivers" as I read...simply amazing all you are doing! "Invest Canada" should be following you, as there is no better way to promote and market Canada and NL!!! Congrats ladies.....you are true ambassadors, bridging cultures and lives with music and dance......and probably a few "swallows" as well. You are truly "rockin' the world"......enjoy every moment..thanks for sharing as you go! Fantastic ladies, How proud you should be representing Our great country,Canada and beautiful NL.This picture says it all.Talent,colours and of course our NL'S.beautiful kindness. All of this while having such fabulous fun. Continue on , you are indeed fabulous ambassadors . I can't wait for "our" next stop and performance. This is the first time I've read your blog and I can't wait to read more of it tomorrow. Say hi to Ms. Fleming for me. Sounds like you are all having a wonderful time. One of these trips I'll have to find a way to join you all. Please give my mom (Anne Marie Fleming) a big hug for me and tell her that her daughter misses her so much and her grandbaby misses her too. My mom is in the choir and Valerie is an old friend, and former choir director of mine. I have enjoyed your posts and look forward to more!! Thank so much for sharing !! My sister Kelly is also in your choir trip.